Climbing School Extension: Some team members from our Ecuador Climbing School also opted to do our one week extension. On Tuesday the extension team summited Antisana (18,714′ / 5704m). 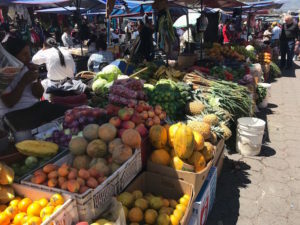 Now they are back in town resting before they climb Chimborazo (20,564′ / 6263m). Pictured here are Jenny and Eli. Good weather and a strong team! 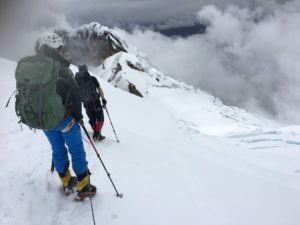 Pico de Orizaba Ascent: “We just came down. 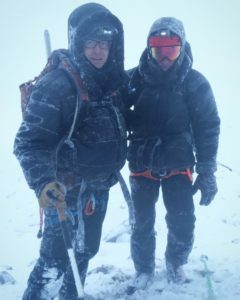 Climbed in full on conditions this morning (Saturday). We climbed to the glacier and on up for a few minutes before deciding to descend in total whiteout. Both clients decided that they were unable to continue up, but they were totally psyched to experience climbing in a snow storm.” Pictured here are John and Ben. Both clients returned to the states on Sunday after a great week of climbing Iztaccihuatl (17,154′ /5229m) and Pico de Orizaba (18,491′ / 5636m) volcanoes. Successful Summit: ¡Cumbre! 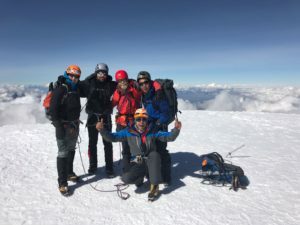 just this morning (Wednesday) the team had a successful summit of Aconcagua (22,841′ / 6962m) and they are headed back to Base Camp this morning, and then soon back to Mendoza. Stay tuned for more updates and photos! Interested in our international climbing schools and Rapid Ascent expeditions? Click here to check out our website. For questions shoot us an email info@alpenglowexpeditions.com or call the office 877-873-5376. We are Eli's folks and we sure appreciate the active blog notes and photos. THANKS! It looks like truly an amazing adventure.